May 2015 n Performance & Hotrod Business n 61 crushed look. Velvet will fade over time if exposed for a long time to direct sunlight. 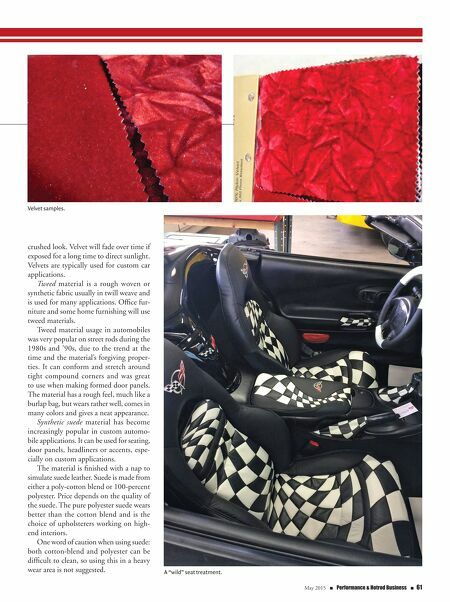 Velvets are typically used for custom car applications. Tweed material is a rough woven or synthetic fabric usually in twill weave and is used for many applications. Office fur- niture and some home furnishing will use tweed materials. Tweed material usage in automobiles was very popular on street rods during the 1980s and '90s, due to the trend at the time and the material's forgiving proper- ties. It can conform and stretch around tight compound corners and was great to use when making formed door panels. The material has a rough feel, much like a burlap bag, but wears rather well, comes in many colors and gives a neat appearance. 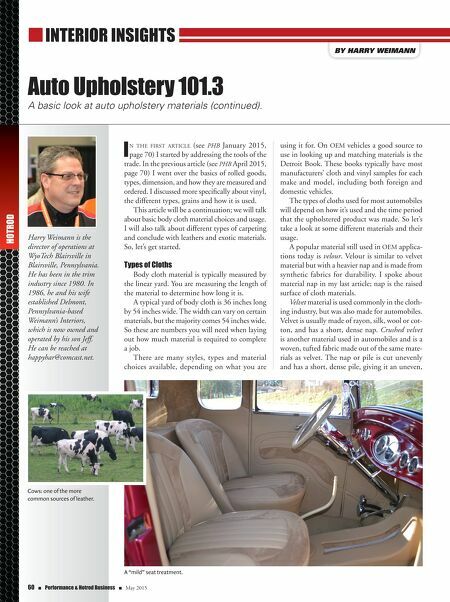 Synthetic suede material has become increasingly popular in custom automo- bile applications. It can be used for seating, door panels, headliners or accents, espe- cially on custom applications. The material is finished with a nap to simulate suede leather. Suede is made from either a poly-cotton blend or 100-percent polyester. Price depends on the quality of the suede. The pure polyester suede wears better than the cotton blend and is the choice of upholsterers working on high- end interiors. One word of caution when using suede: both cotton-blend and polyester can be difficult to clean, so using this in a heavy wear area is not suggested. Velvet samples. A "wild" seat treatment.